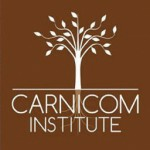 Note: Carnicom Institute is not offering any medical advice or diagnosis with the presentation of this information. CI is acting solely as an independent research entity that is providing the results of extended observation and analysis of unusual biological conditions that are evident. Each individual must work with their own health professional to establish any appropriate course of action and any health related comments in this paper are solely for informational purposes. Biofilms are a highly effective defensive measure by microorganisms to ensure their survival. 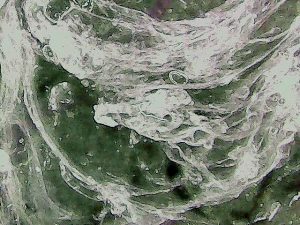 The encasement of the microorganism within a shield of mucus or slime material creates a highly impervious shield to dispersal or elimination of the bacterial or microbial form. 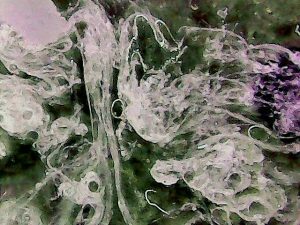 Biofilm removal is generally a costly and difficult process under the best of circumstances; industrial processes (e.g. pipeline efficiencies) and water treatment are two examples of where challenging environments for removal exist. The existence of biofilms is an especially important topic with respect to human health, and they are commonly associated with chronic conditions that are difficult to ameliorate. There are some beneficial biofilms within the body, however, many of them contribute to disease by evading the immune system and allowing the proliferation of harmful microbial species within. According to the National Institutes of Health, approximately 80% of all chronic infections are associated with biofilms. 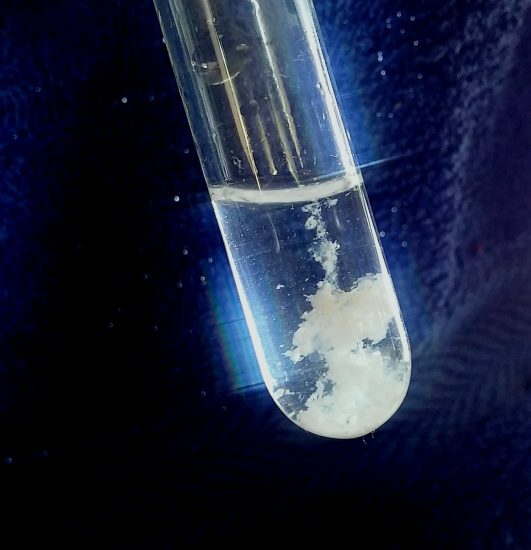 Biolfim sample under examination developed from vitamin biochemical extraction techniques. 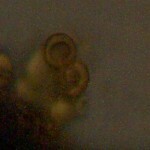 Biofilm images under low power microscopic examination (~20x). 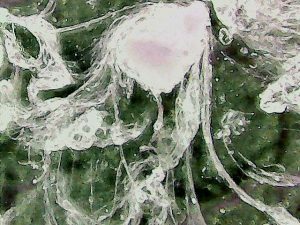 The production of the biofilm shown above has been verified to result directly from the growth of the microorganism (CDB) that has been established as the root source of the “Morgellons” condition. 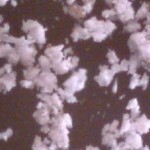 This has been accomplished with the use of culture techniques that are, in turn, based upon the use of the biofilm. The culture equivalency has been established with the use of visual and physical properties of growth, microscopic observation, and visible and near infrared spectrometry. In addition, a sensitive test method for nitrite detection and concentration has been developed, and it has been applied to the cultures with success. Blood, urine, body fluids, and solutions in general can now be tested for nitrite concentrations. The existence of nitrites in this specific microbial growth has now been established as one of several significant markers of the existence of the microorganism. In addition, the composition of the materials as biofilm has been confirmed by chemical analysis, in addition to the visual and physical properties. The biofilm is known to be composed of both polysaccharides and amines; these are each hallmark components of biofilm composition. In the course of this work, additional sensitive colorimetric tests have been developed to test for protein existence and concentration; these methods exceed the sensitivity of the Biuret reagent method by roughly one order of magnitude. These methods may also be applied to body fluids and other solutions in general. The colorimetric tests that have been developed are of high value in enhancing general laboratory procedures that are commonly in use and need. 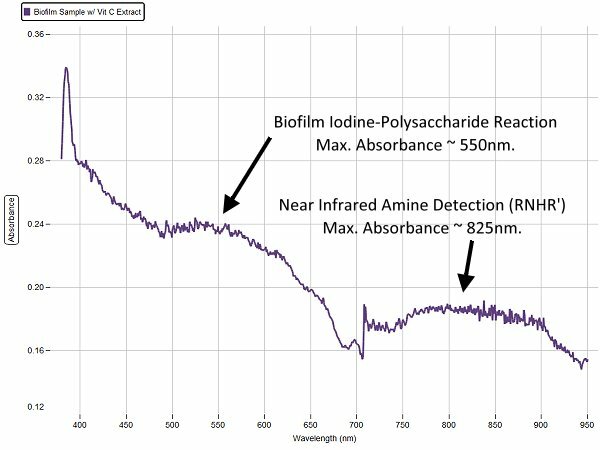 Visible light spectrometry techniques applied to the analysis of the biofilm composition. 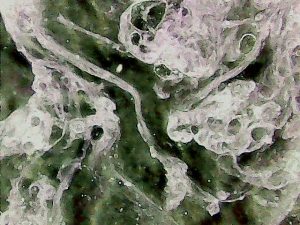 The existence of biofilm with a direct connection to the Morgellons condition exists as one of the most important health issues to recognize and contend with. As mentioned above, biofilms are commonly associated with chronic health conditions and pathology and their removal or reduction presents special and complex challenges. The methods and discoveries of this paper yield a pathway toward the mitigation of the some of the symptoms and effects that are known to accompany biofilm production within the body.